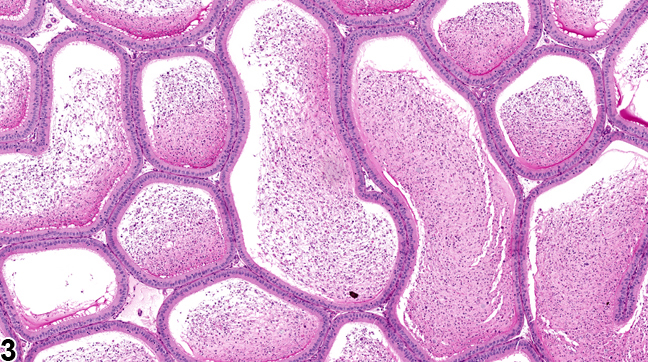 The presence of sloughed testicular germ cells or cell debris in the ductular lumen is a common change associated with spermatogenic disruption in the testis. 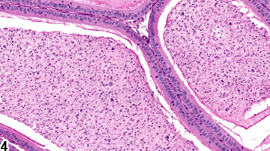 Although it is not a primary epididymal lesion, it is important to record the finding because it provides a sensitive indicator of testicular toxicity and may be a more sensitive end point than the originating testicular lesion. The change is characterized by the presence of intact cells (often recognizable as round spermatids or spermatocytes) and/or cell debris intermixed with mature sperm within the ductular lumen. 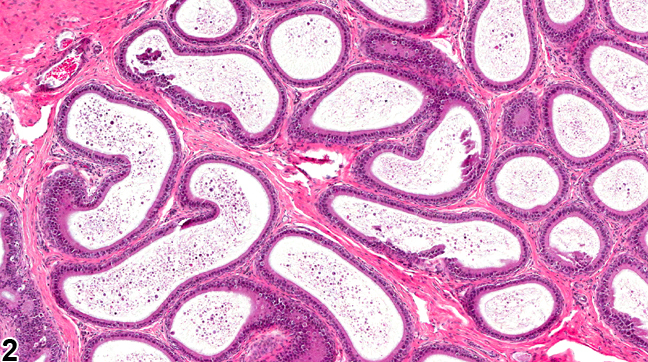 The change can be distinguished from a primary epididymal lesion by examination of the epithelium of the surrounding ducts. 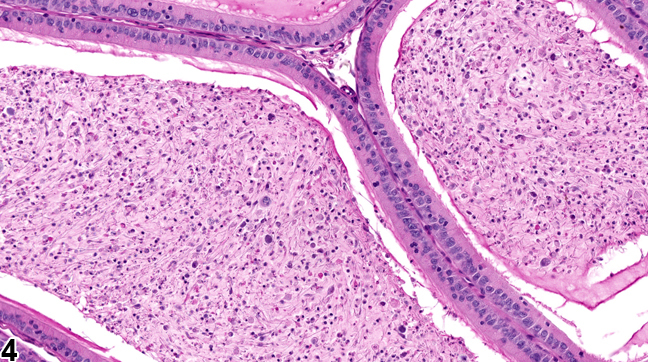 If the cell debris is associated with degeneration or necrosis of the epididymal epithelium, a primary epididymal lesion should be considered (see Epididymis, Epithelium - Degeneration). The normal young adult rat has very few sloughed cells in the epididymal lumen; the mouse generally has a few more as a background finding. Prepubertal and peripubertal animals, as well as aging rodents, will have increased numbers of sloughed testicular germ cells, so it is important to establish the normal background level in age-matched control groups. Luminal cell debris should be recorded and graded and should be discussed in the pathology narrative if the incidence and/or severity appears to be related to chemical administration. 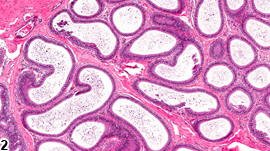 If both epididymides are involved, the diagnosis should indicate bilateral. Correlation with any associated spermatogenic disturbance in the testis should be noted in the narrative. Correlation with any spermatogenic disturbances should be noted in the pathology narrative to aid interpretation. Foley GL. 2001. 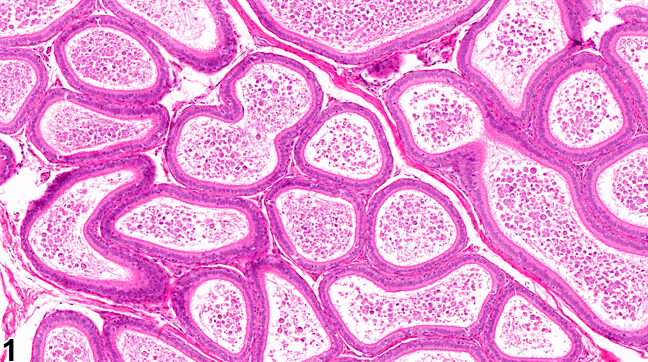 Overview of male reproductive pathology. Toxicol Pathol 29:49-63.